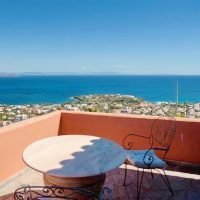 Overlooking the beautiful bay of **** this new built villa offers unparalleled views of the sea below and the White Mountains of Crete. 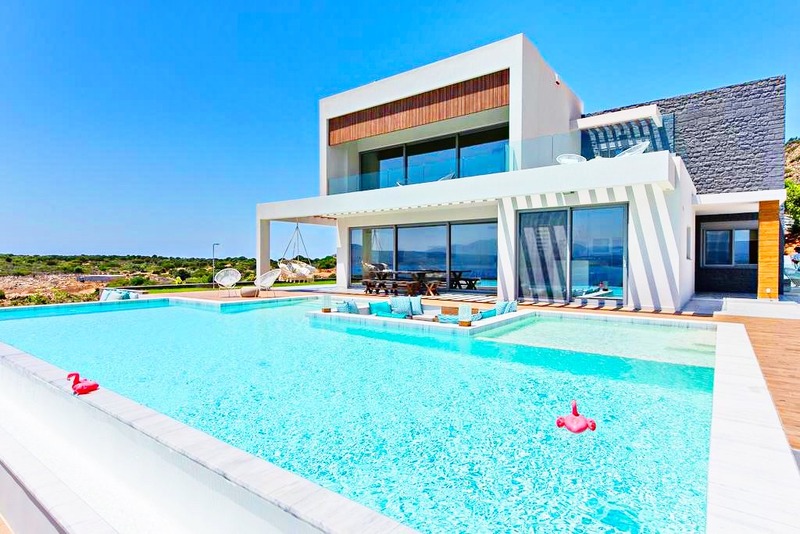 For those seeking a modern Villa, with the highest specifications, easy access to the airport and to the Chania town, privacy, pool and amazing sea views, this is the perfect place. The Villa has 4 bedrooms and 4 bathrooms (3 ensuite), designed in the most sleek modern style and specifications. 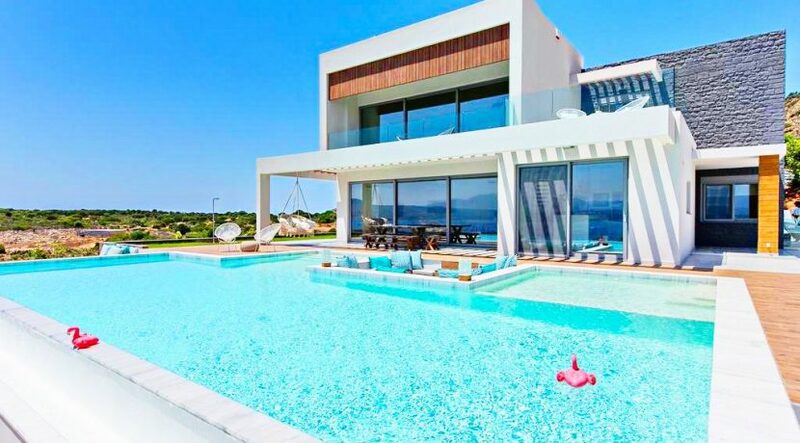 This 5 star luxury villa is overlooking the bay of Chania and embraces the sea like no other in the area. Due to Privacy Reasons , in order to see photos and learn more, a Confidential Agreement needs to be signed prior any other information. A private world of elegance, luxury and supreme hospitality! Villa at Chania is a truly stunning property in one of the most exclusive locations of Chania. Overlooking the magnificent Bay of Marathi, this exquisite villa offers unparalleled views of the sea and the White Mountains of Crete. For those seeking tranquility in a luxurious yet cozy atmosphere Alas Villa is the perfect place for you. Villa has in total 4 bedrooms and 4 bathrooms, three of them are en suite. All designed in the most modern style of all the appropriate specifications. If you are planning on inviting extra guests, 2 of the bedrooms can be arranged to become twin or double allowing you to spend time with your loved ones. In the ground floor, there are two bedrooms, one master bedroom with walk-in closet, ensuite bathroom and satellite tv and one more with closet, satellite tv and bathroom right outside of it. All bedrooms have their private terraces with siting area and separately controlled A/C system. In the living room, there is a comfortable sofa, a 49inch 4k satellite TV and a playstation 4, a large dining table and a three-sided fireplace. The kitchen offers an 8 person island bench and is fully equipped with an oven, 4-pot stove, microwave oven, extractor, sink, double-door fridge, wine cooler and all the necessary small electrical appliances. The first floor is complied of two bedrooms. One with an ensuite bathroom, terrace and satellite tv and one master bedroom with walk-in closet, en suite bathroom and satellite tv, ensuring residents have a private space where they can enjoy the uninterrupted view. In the same level there is a business corner with an office where residents can work or study. The outside area boasts a stunning infinity pool with crystal clear fresh water, sun loungers, parasols, a built sofa area at the same level of the pool and a large outside dining for 8 to 10 guests. 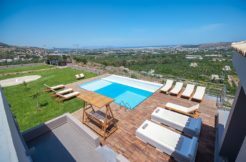 Alas Villa is the perfect spot to watch the sunset, with a panoramic sea view; this 5 star luxury villa is overlooking the Bay of Chania and embraces the sea like no other around. The captivating design of the indoor areas, the unique decorative elements, and the glorious private pool make Villa Alas Chania an excellent choice for your holiday vacations in Crete. Villa is located just 2 minutes drive away from the sandy beach of Marathi that is ideal for families with children. There also many restaurants there in order to enjoy your meals. The villa is also just 15-20 minutes drive away from Chania city centre. Loutraki that is just 5 minutes drive away has a very nice quiet beach with fine sand and crystal clear shallow waters, especially suitable for children. It is very well organized and provides all the common touristic amenities, under the deep shade of the very high trees on the beach. You can rent umbrellas, eat in the taverns of the area, rent rooms and enjoy various water sports. Loutraki is an ideal choice for a nice beach close to Chania city. There is a big parking area with many high trees offering their shade to the visitors. Akrotiri Region is a place for nature lovers, with interesting walking and hiking paths through the unspoiltm gorges with amazing diversity, natural beauty and living traditions. With picturesque sandy beaches, all awarded with the Blue Flag, century-old monasteries and churches, impressive caves with rich lithological and archaeological interest, historical monuments, Akrotiri attracts many visitors every year, who enjoy Cretan hospitality and nature at their best. 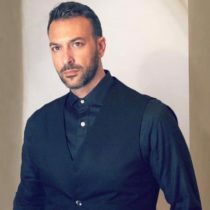 Being one of the leaders of European tourism, Greece offers to its citizens and foreigners the climate of attractive investment in the field of real estate acquisition. Such kind of investments in countries with developed tourist infrastructure are characterized by minimum risk and dynamic payback in case of acquisition of commercial objects. Greek legislation allows the acquisition of real estate by citizens coming from countries that are not in the European Union. For those who regard real estate in Greece as an investment of capital, now is the most favorable market conditions. Because of the economic crisis there was a considerable falling of the prices for the Greek real estate. Having experienced that situation, many skilled investors re-enter the market of the Greek real estate. That, in the nearest future, can become the reason of growth-return, especially in the sector of the objects located in resort zones. Ο επαγγελματισμός και η ποιότητα του χαρακτήρα σπάνια συνδυάζονται τόσο ισορροπημένα, όσο σε σας. Πολλά εύσημα για δύο χαρισματικούς επαγγελματίες του είδους τους.